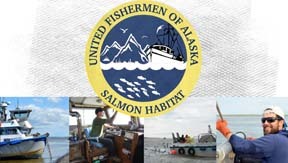 UFA Special Announcement: Donations to USCG Will You Be a Hero to Alaska’s Coast Guard? North Pacific fishing trade associations are banding together to provide a forum to help Alaska’s USCG families in need. Each trade association is aiming to raise $7,500-$10,000 in tax-deductible contributions. We’ve worked directly with the USCG to set this up in a way that is legal for them to accept and helps them bridge their financial gap. See the below message from Chris Woodley, retired Coast Guard and Executive Director of Groundfish Forum, for more information and for the link to the donation platform. The USCG is there for us in times of need, let’s show them that Alaska Bering Sea Crabbers will support them in times of need, too. ** Will You Be a Hero for Alaska’s Coast Guard? This week many Coast Guard members and families in Alaska are facing hard times – thousands of active duty, reservists, and Coast Guard civilians have not been paid since December 31st. Yet the men and women of the Coast Guard are still working hard every day – protecting our fishermen and our fisheries in Alaska. They are still out in the Bering Sea standing the watch on the bridge of a cutter; they are carefully maintaining a H-60 helicopter in the hanger at Air Station Sitka so that it will be ready to respond to “the call” at a moment’s notice; they are conducting safety exams on our boats in Dutch Harbor, and they are listening intently to the radios at Comm Station Kodiak, ears straining through the static to detect the words “Mayday Mayday Mayday” from a fishing boat in peril. Coast Guard men and women have always been heroes for our industry, but we have to ask ourselves which unit, which bosun mate, which rescue swimmer will be our hero, our savior in the weeks to come? We know it will happen, we know we will need their help in some way, shape or form. The Coast Guard is doing their best for us, but they are worried. Worried because they haven’t been paid since December 31st and now the rent is coming due, the truck needs to be repaired, the vet bill for the dog was really high, and now they are getting low on groceries. Because of all this many Coast Guard members and families in Alaska need a hero of their own. I am asking you to be hero and help a Coast Guard member make ends meet during the government shutdown by contributing to Coast Guard Mutual Assistance (CGMA). Making a donation is easy! Just cut and paste the link below into your browser and click Donate! Contributions can be made via credit card from businesses and individuals. All donations to my fundraising page will be directed to Coast Guard personnel in the 17th District (Alaska) and the monies raised will be distributed to Coast Guard families in need across the State. I am hoping to raise $65,000 from the fishing industry within the next week– that amount will provide a $1500 loan to 50 Coast Guard families in Alaska. Later today I will send out a suggested contribution amount for each of your trade associations – please let me know if you can commit to raising that amount. As a former Coast Guardsman stationed in Alaska, I cannot overstate how much our assistance can mean to a Coast Guard family in need. They have always been there for us and I know we can be there for them.